BILOXI, Mississippi -- Mississippi Gov. 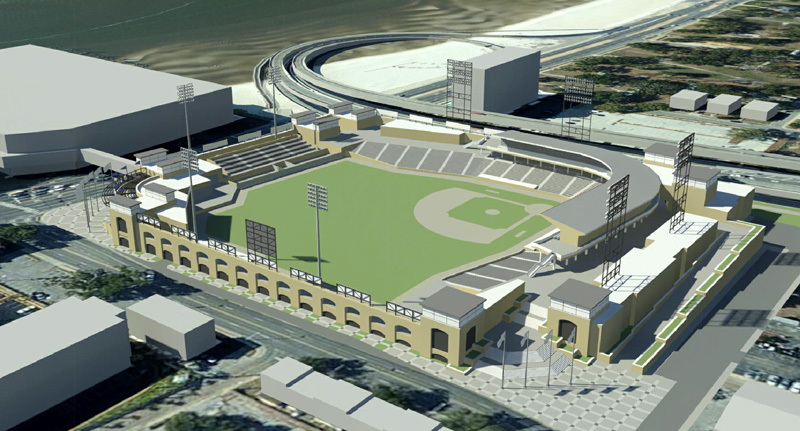 Phil Bryant announced today that the state will contribute $15 million in matching funds toward construction of a new minor league baseball stadium on U.S. 90 in Biloxi. Bryant, speaking at a press conference in the Biloxi Visitors Center, said the 7,000-seat stadium will attract an estimated 300,000 visitors annually. Bryant was joined by U.S. Sen. Roger Wicker and other state and local officials in making the announcement. Noting the impact the Mississippi Braves have had on the Pearl area, Bryant said the new Biloxi stadium -- to be named "Caillavet Stadium" -- would be an economic development driver for the area. "The dynamics of that entire area changed," he said of Pearl. The Biloxi City Council last Tuesday approved -- by a 5-2 vote -- a resolution to purchase $21 million in general obligation bonds to help build a $35 million, 7,000-seat ball park north of the Beau Rivage Casino & Resort.